The weather was threatening, (The weatherman said it was going to rain) but as it turned out we did not get wet. Jose was familiar with climbing techniques and had no problem remembering the knots and handling the throw line. By the time that we stopped for lunch had made made 6 in tree transfers and was feeling very confident in his newly learned climbing techniques. After lunch we got back to work tree climbing and Jose made another 6 transfers. By the end of the day he had made it to the top setting of over 85 feet in a white oak. We spent another hour or so talking about equipment selection and maintenance before wrapping it up for the day. We started out Sunday morning with a discussion of tree risk assessment before going back out to start climbing again. After a bit of tree climbing to get warmed up and to make certain that the lessons from the previous day had all been retained we went into “Rescue mode”. We always teach our students some basic rescue techniques for getting a stuck or injured DRT tree climber down to the ground safely. 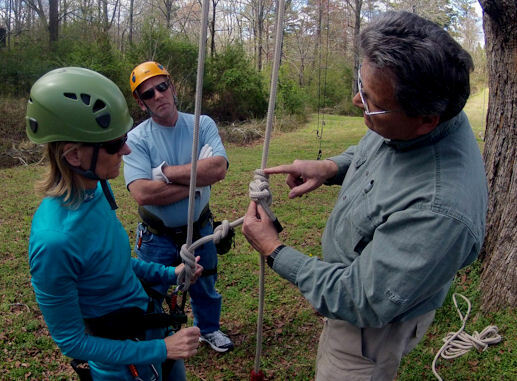 We had a great group of students for our Basic Tree Climbing Class this month. All six students showed up enthusiastic and ready to climb! We keep our classes small to assure that each student receives plenty of individual instruction, since most of our class time is spent climbing we don’t have large classes. We first allowed the students to climb on settings that we had established, just so that they would get a feel for how to go about climbing. New students often expect that they will require a great deal of upper body strength, in fact when done properly most of the climbing energy is derived from the legs. From there we began showing them the knots so that they will have a general idea of what the system looks like. We accomplished this on Friday afternoon, this way when the students came back refreshed and ready to climb on Saturday they already have an idea of what we would be doing all day long. By showing them on Friday and then Saturday having them climbing and tieing the knots we find that people are better able to retain those skills and will continue climbing long after they have left the class. This class formed some strong friendships as they went thru the strenuous exercise and excitement of learning a new set of skills that would allow them to go to places that no other people had been. I recently had the opportunity to visit a friend up in Canada and do some tree climbing… this was a wonderful place to go if you enjoy the outdoors and especially if you enjoy tree climbing. Vancouver Island is a beautiful place with plenty of unspoiled countryside to explore. I would highly recommend it as a vacation destination to anyone looking for a place to get away, slow down and just plain enjoy what life and nature have to offer! 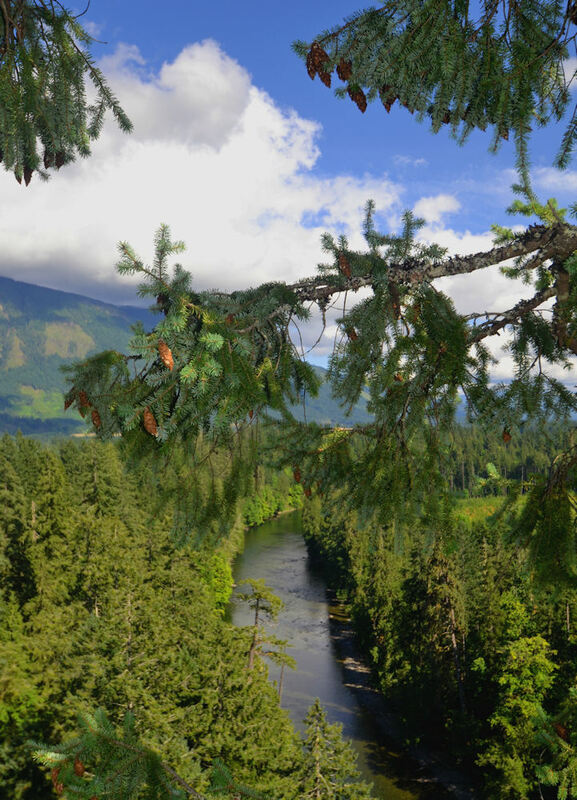 227 feet up in a Douglas Fir Tree, A great way to look at the world! June 1st, was a perfect Saturday for a tree climb! The First Saturday of each month is our monthly open climb at The Sawnee Mountain Preserve, In Northern Forsyth County. We had 8 Climbers, this month all of the climbers were in the young category but most months some of the parents participate. Sometimes we even get grandparents climbing! Most of the time when I climb for FUN I am climbing in what is commonly referred to as a “Wild” Tree, Very simply this is a tree that has not been cleaned out by removing dead limbs and other hazards and entanglements. 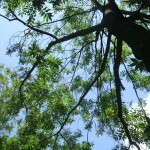 In fact most of the time when I go out I select a tree that has not been previously been climbed. When climbing a tree for the first time it is necessary to take more time assessing the tree because you have no prior knowledge of the tree. In this type of climbing you are relying entirely on your training and past experience. Knowledge of the various strengths and weaknesses of the different species is a good starting point. For Example in a Tulip Poplar in general you you want to keep your settings in close to the trunk because they have rather brittle wood. Then you access the tree for particular hazards as well as it’s general health. After deciding that you have found a suitable tree you plan your entry point ans your expected climbing route. When climbing in a remote area it is important to keep in mind how far away or if there is Rescue help available. If you are climbing alone in a remote area this is even more important since you have only your self to count on to get out of a bad situation. The bottom line is that you have to keep in mind what the reality of your situation is and adjust how much risk you are willing to take on each step of the climb. If you are climbing with other people you may be willing to place your rope on a setting that may cause you a retrieval problem, since if you get your rope stuck there is another climber there to help you out. If you were climbing alone you would not want to take the chance of getting your rope hung in a particularly inaccessible location because this could lead to a serious incident. One Basic Safety Precaution that is often overlooked is to leave word with a friend before you go out about where you will be climbing and roughly what time you expect to be back. This will provide you with the ultimate rescue plan of “Wait for Help” at least you know that at some point someone will come looking for you. Now you may be saying yea but I carry my cell phone I can call for help any time that I Need to… Remember: Batteries Die, Cellphones Fall, and in truly remote areas there often is NO cell coverage. Adjust your mindset to how much risk is acceptable based on the circumstance and Do your self a favor, leave word with a friend. It is a cheep insurance policy and it could save your life!